During 2005, Pakistan became the 22nd country from which there was evidence that SRI methods can provide multiple benefits. The ICIMOD Newsletter (no. 46) from the International Centre for Integrated Mountain Development, based in Kathmandu, reported on its introduction of SRI last year into Hilkot village, Mansehra District, in the Northwest Frontier Province. The newsletter noted that SRI methods "... resulted in a 50% yield increase. The skeptical farmers who transplanted the rice found these results unbelievable." Following a visit to Sri Lanka during September 2005, Dr. Mushtaq Gill, director-general for the On-Farm Water Management wing (OFWM) of the Punjab State Department of Agriculture, initiated a number of SRI trials and field demonstrations together with other partners. As observed by Norman Uphoff during a October 2006 visit (see trip report), on-farm trials in Okara District south of Lahore gave an increment to yield of 30-45% with basmati varieties. A very evident benefit was much-reduced lodging of basmati rice during rainstorms. At the time of the report, some farmers were also combining SRI with direct-seeding and zero tillage (ZT) as well as with the use of raised beds. On-station trials at the Agricultural University at Faisalabad (UAF) also began trials during 2006 (see 2007 Gill presentation at Cornell University). SRI workshops were organized by the Lok Sanjh Foundation in 2009 and 2010 in Sheikhupura district, one of the main basmati rice growing areas in Pakistan, and this NGO is now launching an expanded program for organic SRI production. As of 2013, as many as 300 farmers in 65 villages between Sheikhupura and Sialkot have reportedly adopted the SRI as a result of Lok Sanjh training. Roughly 80% of these farmers are using organic SRI methods. During 2009, results of the first full mechanization of System of Rice Intensification cultivation methods (called MSRI for "mechanized SRI") were reported by Mr. Asif Sharif, who devised/modified various implements to substantially reduce the labor requirements for SRI. His company, FarmAll Technology, was able to capitalize on SRI inherent production potentials and to reduce the crop water requirements by 70% over usual levels of irrigation in Punjab state of Pakistan (see MSRI section below). Yield on Sharif's 20-acre trial plot averaged 13 tons/ha. Second season trials in 2010 confirmed water productivity (0.92 kg/m3) was 2-3 times higher than with conventional sowing. 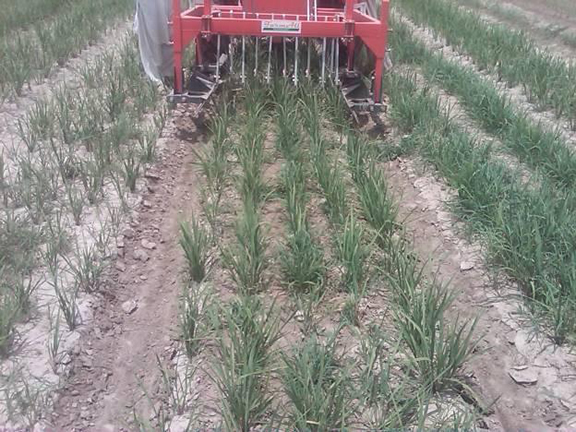 During 2010, FarmAll adapted further adapted SRI principles and machinery for a succession of other crops, including wheat, onion, carrots and potato. In 2011, the System of Maize Intensification (SMI) was added. [November 23, 2016] Asif Sharif, Chairman and Chief Executive of PEDAVER Pvt. Ltd. in Lahore, Pakistan, who visited SRI-Rice and colleagues at Cornell University during November, 2016, presented a seminar entitled Innovations with Mechanized SRI in Pakistan: Converging the System of Rice Intensification with Conservation Agriculture (CA). In the talk, Sharif presented the progress he has made by mechanizing SRI as well as adapting SRI/SCI principles to a number of other grain and horticultural crops in Pakistan. According to a February 5, 2013, article in the Express Tribune, the System of Rice Intensification (SRI), was introduced in Pakistan's Sheikhupura district by the Lok Sanjh Foundation (a non-profit foundation working with rural communities) about five years ago. As of 2013, as many as 300 farmers in 65 villages between Sheikhupura and Sialkot have reportedly adopted the SRI method of rice cultivation. Farmers, 80% of whom are using organic SRI methods, have noted many benefits, including the use of less water and stronger roots prevent lodging and crop loss and seasonal fungal and pest attacks. In addition to compost, organic farmers use bio-pesticides used by farmers contain neem, nicotine, lemongrass or sorghum; during the past five years, no pest attacks were reported. According to Lok Sanjh CEO Shahid Zia, the cultivation of SRI crop produces around five to ten mounds more than traditional rice crops per yield as a result of lower grain loss due to heavy winds. While he noted that SRI can be more laborious than the traditional methods and indicated the government and many NGOs are reluctant to introduce SRI due to its methods (which reduce purchased inputs), he observed that,“In the face of the water crisis and heavy pollution of natural wetlands, there is an immediate need to introduce such technologies." (See also 2010 and 2009 reports of trainings by Lok Sanjh). FarmAll's CEO, Asif Sharif, continues to experiment with combining SRI principles with conservation agriculture (CA) and organic agriculture for a number of crops. Most recently, he has adapted this SRI/CA/organic combination that he calls "paradoxical agriculture" to create a System of Maize Intensification (SMI), which involves raised beds and mechanization. 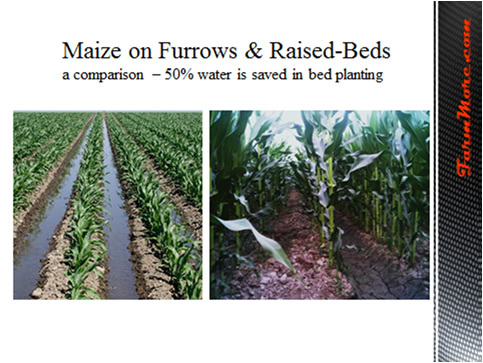 (Click on comparison of furrows vs raised beds at right). SMI involves 1) timely planting, 2) minimizing plant trauma through use of precision weeder/soil aerator for mechanical weeding between plant rows on the raised beds 3) optimally wide spacing between plants (69cm between rows and 16.5cm spacing between plants in Spring; 20 cm between plants in Autumn crop) 4) weeding and active soil aeration (once in Spring and twice in Autumn), 5) precise water management (as is possible with raised beds) and 6) compost application to enhance the structure and functioning of soil systems. An unusual application of SRI concepts has been launched in Punjab Province on April 18, 2011, combining SRI principles with conservation agriculture (no-till) and organic management. Asif Sharif, president of FarmAll Technology Ltd. in Punjab province, calls this combination ‘paradoxical agriculture’ because farmers can get more production with reduced inputs. For over 100 years, the Pakistan Army was in possession of 17,000 acres of prime farm land in Okara district. Of this, 13,000 acres were leased to small-farmer tenants on a share-cropping basis with the military farm management. Five years ago, tenants formed an association and have campaigned for land ownership rights and an end to share-cropping. The association has sought guidance from FarmAll on crop production over the past few years. Now it has asked FarmAll to play a more active role in farmers’ training and machinery support. On April 18, the association arranged a four-hour educational program with Asif Sharif for over 100 peasants (photo at right). The farmers have offered land to set up training and demonstration units on their farms for various crops and for machinery operation. The first crop will be rice, planted with SRI practices in several locations, followed by other crops in rotation in two more seasons. FarmAll’s ‘paradoxical agriculture’ integrates rice production with other crops to enhance soil fertility. FarmAll will supply a set of four machines free of cost and will train farmers to be operators. A FarmAll supervisor will implement the project, which will be monitored by Sharif himself. These trials-demonstrations are expected to lead to large-scale use of the new methods throughout the entire area. Reports will be posted as this initiative progresses. Asif Sharif, executive director of FarmAll Technologies in Lahore, was invited to make a presentation to regional parliamentary round table caucus on food sovereignty, meeting in Islamabad, January 23-24. Participants included South Asian parliamentary and peasant leaders from Bangladesh, India, Nepal and Afghanistan. Sharif briefed the round table on his adaptations of SRI methods and principles to mechanized operations -- with conservation agriculture (permanent raised beds) and organic management as well. (See video and 2009 and 2010 items below for more information on these operations). The round table was hosted by the Pakistan Parliament’s Committee on Agricultural Affairs, in cooperation with the South Asia Alliance for Poverty Eradication (SAAPE) and its thematic group on food sovereignty, climate change, livelihoods and employment. Visitors included: Sayedul Hoque, MP, chairman of Bangladesh’s parliamentary standing committee on food and disaster; Probadh Pande, member the Lok Sabha in India; Rehana Aktar, MP, Bangladesh; Prem Dingle, general secretary of the All-Nepal Peasant Federation; Keshav Lal Shrestha, Deputy President of the ANPF and a former minister in Nepal, and Arif Afghani, general secretary of the Afghan Labour Revolutionary Organisation. Pakistani participants include the Ministers for Food and for Education and Science, and other parliamentary . Following up a first trial in 2009, where a mechanized version of SRI (MSRI) was introduced on a 20-acre laser-leveled field in Punjab Province by Asif Sharif of FarmAll Technology Ltd. in Lahore, these practices were repeated in 2010. The trial combined SRI principles and practices with those of conservation agriculture, growing a hybrid rice on permanent raised beds, starting with 10-day seedlings planted at 22.5 cm spacing, transplanted into dry soil holes with precision applications of water, compost and fertilizer, and then mechanical weeding that aerated the soil very thoroughly. Staff of the Pakistan Agricultural Research Council (PARC) supervised the evaluation of the season’s cropping and calculated a reduction in water use of 60% for the cropping season along with high yields. The water productivity (0.92 kg/m3) was seen to be 2-3 times higher than with conventional sowing. Accordingly, a review committee of PARC has suggested up-scaling of this technology by demonstrating it on farmers’ fields. Plans for this are being worked out between FarmAll and PARC. A training workshop on SRI was organized by the Lok Sanjh Foundation on April 5, 2010, in Sheikhupura district, one of the main basmati rice growing areas in Pakistan. Attended by about 35 farmers from Sheikhupura and Nankana Sahib districts, this was the second SRI workshop conducted by Lok Sanjh, as part of its year-long Year of Rice Action (YORA) campaign. The workshop sought to promote biodiversity based ecological practices among farmers in Pakistan's Punjab Province, and introduced SRI to the farmers as a dynamic, promising, efficient and cost-effective method of growing rice. Asif Sharif, director of the FarmAll Technology Pvt. Ltd. in Punjab province, has taken the materials available on the SRI website and has designed/modified four machines/implements that enable him to cultivate with SRI concepts and adapted methods on a large scale with much less labor input and a 70% reduction in crop water requirements compared to usual irrigation levels in the province. The results of the first full mechanization of System of Rice Intensification cultivation methods (called MSRI for "mechanized SRI") are quite positive, with average yield of 13 tons/ha. (See details of the MSRI process, additional photos of seedlings and transplanting, a TV interview with Sharif and a 2011 video on MSRI). The SRI field of 20 acres (8 hectares) was first laser-leveled, so that water could be applied very evenly and sparingly. The first implement constructs raised beds mechanically (at right; click on photo to enlarge), with straight furrow on either side for irrigation (and for guiding other field operations). The planting operation is carried out by five laborers who ride a second implement, dropping 10-day-old seedlings into holes made mechanically in dry soil 9 inches apart (22.5 x 22.5 cm). The planting machine (photo at left; also see video), with a water tank kept filled by a bowser, sprays water into each hole so that the roots became coated with enough soil to begin rooting. The machine also injects some compost near the plant roots, so that the soil is enriched organically. This precision application reduces compost requirements from 4 tons/hectare to 200-400 kg per hectare, while still supporting good plant growth. When the first irrigation is done after transplanting, water is applied to cover the whole field to a depth just 1 inch above the top of the raised beds. This application further settles the seedling roots into the soil, but very shallow so as to induce more tillering. From 10 days after transplanting, the raised beds were weeded at intervals by a mechanical weeder (photo at right; also see video). This has blades set to remove weeds and aerate the soil between plants that are spaced 9 inches apart. The subsequent irrigations are made only into the furrows between the raised beds so that very little water is applied, and the subsoil movement of water is able to satisfy plant needs. The Minister of Agriculture visited the field at the end of August, when average tiller number had reached 90 tillers per plant. When an evaluation team from the University of Agriculture at Faisalabad visited the field during early September, the counting of tillers was videoed, showing a plant with 118 tillers. Overall, plant growth was remarkable, with tillering reaching over 100 tillers per plant in many locations, and the number of tillers per m2 averaged 364. The yield, from 10 sampled locations within the field, averaged 13 tons/ha, with a fairly wide range. The grain harvested from 1 m2 crop-cuttings ranged from 743 g to 2,192 g, which represents a yield range of 7 to 21 tons/ha. 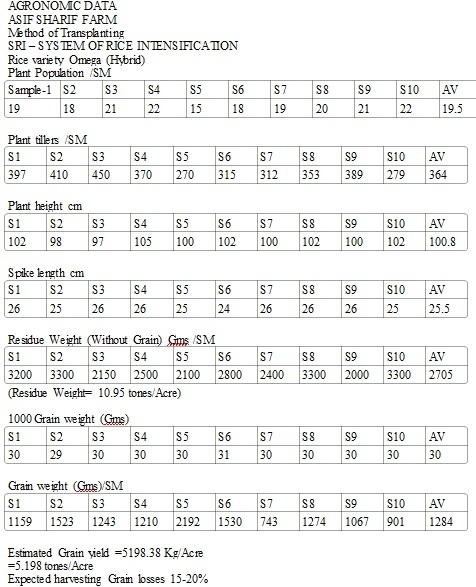 Grain weight across the samples was quite uniform, around 30 grams/1,000 grains (see trial results). The intra-field variation reflected the impact that laser-leveling can have on soil fertility, as top soil gets scraped off higher portions and redistributed to lower ones. Where the soil fertility was good because topsoil was not reduced, the SRI crop performance was spectacular. In some parts of the field, yield was reduced by a virus that left a large percentage of spikelets unfilled. This disease affected also other rice crops in the area. This first season of fully mechanized SRI production thus gave very encouraging results, and Sharif has plans to improve performance in coming seasons as more experience is gained and further innovations are made. He is now applying his knowledge of agriculture and mechanization also to other crops, such as wheat, sugarcane, carrots, potatoes, etc. to which SRI concepts and practices are being extended. As part of Lok Sanjh Foundation's (LSF) Year of Rice Action (YORA) activities, LSF organized a one-day training workshop on System of Rice Intensification (SRI) in relation to Biodiversity-based Ecological Agriculture (BEA) on May 26, 2009, at Sheikhupura District, the main Basmati growing area of Pakistan. The workshop was intended to promote SRI and BEA in Pakistani Punjab's rice farming systems. Farmers from different areas of Sheikhupura who have been identified as key researcher farmers by LSF participated in the event (see CEDAC report). Among the many benefits of SRI noted at the workshop, an important feature of SRI noted was reduced water use. As the alkaline tube well water used for irrigation in the Pakistani Punjab is deleterious to soils, farmers cannot only reduce the production costs due to pumping but reduce the adverse effects of high water pH by using less water. Irfan Ali, who previously attended the SRI Training in Cambodia, presented LSF results indicating that with less production costs, the SRI plot had lower production costs and had higher yield than the conventional plot did. Follow-up plans were made with farmers to document their progress with SRI over the coming year. 2018. Rice intensification (SRI) and climate change mitigation. Agroinforbank website. December 17. Khalid, Farhan. 2015. Improving the performance of system of rice intensification by seed priming. PhD dissertation. University of Agriculture, Faisalabad, Pakistan. 164 p.
Ahmad, Fayaz, and Hamayoon Khan. 2016. Effect of different fertilizer treatments on the performance of some local rice varieties under SRI (System of Rice Intensification) and conventional management practices at district Swat. Pure Applied Biology 5(1): 37–47. doi:10.19045/bspab.2016.50006. Chadhar, Asim Raza. 2014. Weed management studies in System of Rice Intensification (SRI). PhD dissertation, University of Agriculture, Faisalabad, (Pakistan). Staff reporter. 2013. Rice intensification system prepared by World Bank applauded. SoyaTech website. December 26. Malik, Sonia. 2013. Efficient rice growing technology yet to find takers, Express Tribune, February 5. Sharif, Asif. 2010. Yield data on ‘other crops’ being raised on permanent raised bed using SRI principles with mechanization. FarmAll Technology Pvt. Ltd. System of Rice Intensification website. (6p., 957 KB pdf). [Report for FarmAll Technology Pvt. Ltd., Lahore, Pakistan]. PANAP. 2010. 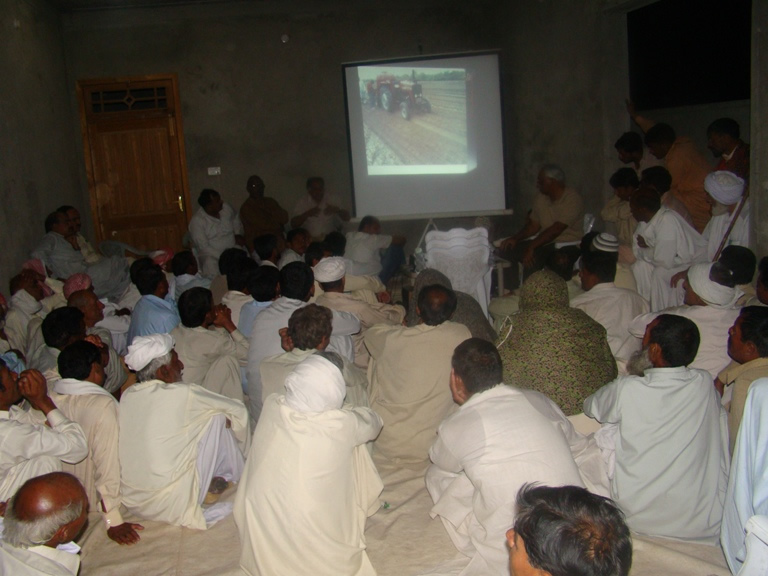 Pakistani Farmers Learn the System of Rice Intensification Training in Pakistan. Press release on the Pesticide Action Network (PANAP) website. 2009. System to enhance rice output developed. The International News (Lahore, Pakistan). October 21. 2009. The System of Rice Intensification (SRI) Training in Pakistan. CEDAC website. May 9. Farooq, M., Basra, S. M. A., and Saleem, B. A. 2006. System of Rice Intensification: A beneficial option. Dawn (online edition). September 4. Sharif, Asif. 2010. SRI Organic Rice - a Process for Commercial Production. Poster at the the 3rd International Rice Congress, November 8-12, in Hanoi, Vietnam. Gill, Mushtaq. 2007 (Sept. 25). Increasing Water Productivity of Rice through Adoption of System of Rice Intensification (SRI), a presentation given to the SRI group at Cornell University, Ithaca, NY, by the Director General for Agriculture (Water Management) in Punjab, Pakistan. 11 slides. (2.38 MB pdf) OR Click on the embedded PowerPoint slideshow below (requires Flash 9 or higher). 2009 (September 11). Three videos on the SRI Cornell YouTube channel provided by Asif Sharif CEO of FarmAll Technology, Lahore, Pakistan. Videos show Sharif's Mechanized SRI (MSRI) project in the Punjab. 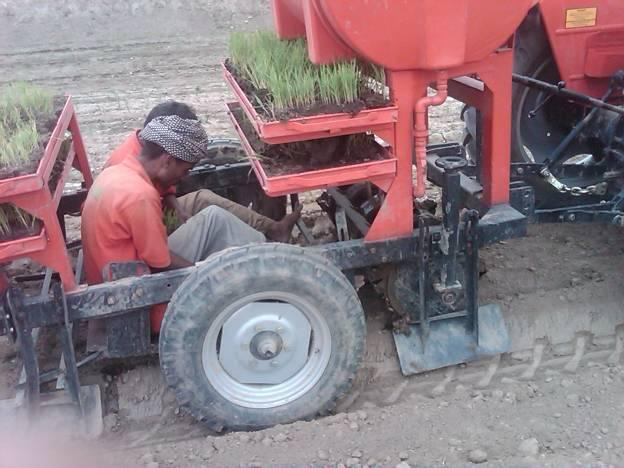 1) System of Rice Intensification - Mechanized Transplanting in Pakistan. 1:01 Min. 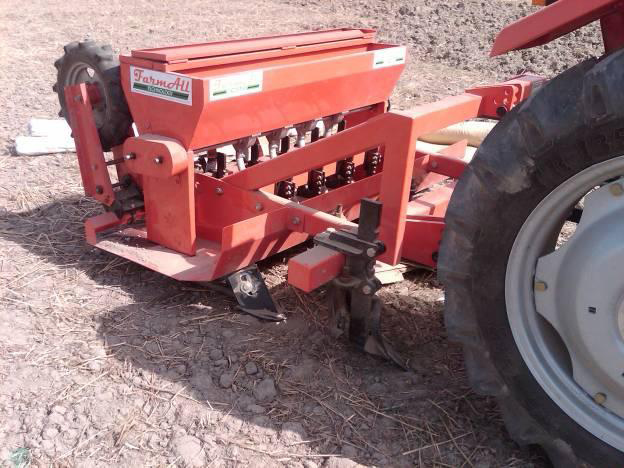 2) System of Rice Intensification - Mechanized Weeder in Pakistan. 1:00 Min. 2009 (November 3). Interview with Asif Sharif about mechanized SRI (MSRI) on YouTube originally produced by and broadcast on Oct. 30, 2009, on AAJ (which means “Today” in Urdu) TV channel in Pakistan. The Pakistan SRI-Rice photo collection is available on the SRI-Rice Picasa album. A slideshow of the photos is also embedded in the summary section at the top of the page. Sharif, Asif. 2009. Mechanized transplanting: System of rice intensification includes 15 photos on the transplanting and growth of rice seedlings in the mechanized SRI (MSRI) project in the Punjab area of Pakistan.